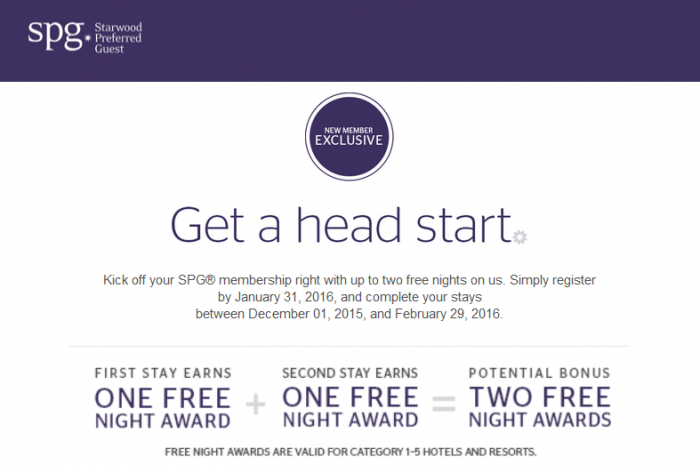 SPG has launched other targeted (Select) New Member Exclusive promotion that is valid for stays between December 1 – February 29, 2016. You can try register for this offer on SPG’s website here. 1. Five elite qualifying nights after first stay and another 5 after second stay for maximum 10 elite qualifying nights after two stays. 2. Earn 2,500 bonus points after first stay and 5,000 bonus points after second stay for maximum of 7,500 bonus points after two stays. 3. Earn 1,500 bonus points after first stay and 2,500 bonus points after second stays for maximum of 4,000 bonus points after two stays. 4. Earn category 1 – 5 free night award after first stay and second free nights after another stay for maximum of two category 1 – 5 free nights awards after two stays. 5. Earn category 1 – 5 free night award after first stay booked using mobile apps and second free nights after another stay booked using mobile apps for maximum of two category 1 – 5 free nights awards after two stays booked using the apps. Each member tends to be targeted once a year for these New or Select Member Exclusive promotions. The free night option would be the best award. If your targeted offer is not listed above, please post a link to the Terms and conditions of your version.